Almost 70 years after a US Army doctor died in combat in the Korean War , his name tag was returned to his children. 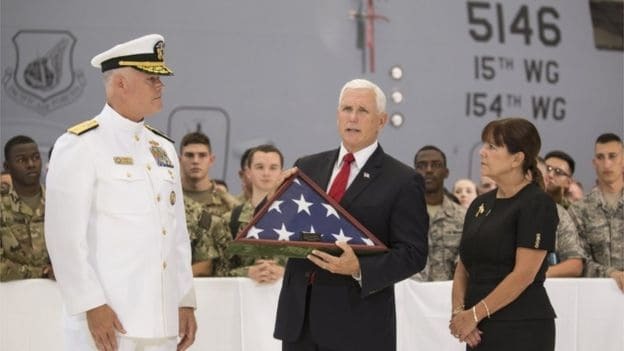 The plaque was in one of 55 boxes of US military remains that North Korea handed over to US officials on July 27 at the request of US President Donald Trump. Sgt. Charles McDaniel was killed in 1950. 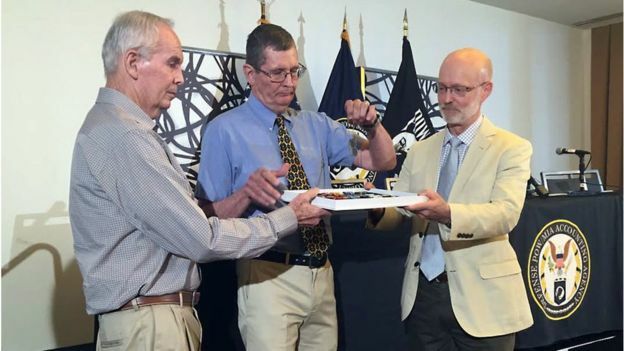 His two children, Charles, 71, and Larry, 70, were given back their board last Wednesday. The object was the only box item that could be associated with a particular soldier so far. The Pentagon seeks to identify who the others might be. The repatriation of this material was agreed between Trump and North Korean leader Kim Jong-un at a summit in Singapore. US Vice President Mike Pence went to Pearl Harbor in Hawaii to receive the 55 boxes earlier this month. The plaque brings McDaniel’s age and history, has two holes and lacks a piece at the bottom. She was found on a battlefield near Unsan, in North Korea, where the military man died in combat. “Suddenly, the Army contacted us and said, ‘We found a nameplate, it’s your father’s,'” he said. But the remains of the box where the plaque was may not belong to Sergeant McDaniel. The US Department of Defense laboratory in Hawaii is still analyzing the DNA extracted from the bones that were with it. Experts say this can take months. Authorities say the bones are in a poor state of preservation, according to the Military Times website. “We do not know if the remains are from my father, but we have at least his sign,” said Charles McDaniel Jr. The American soldier was the son of a farmer from Indiana. He served in Europe for a year during World War II, his family said. When he was sent to Korea in August 1950, his children were 3 and 2 years old. “I was just a boy and I hardly remember my father,” said Charles. His battalion and South Korean forces were defeated by Chinese military in October near Unsan, 96 km north of the North Korean capital, Pyongyang. For two days, 755 family members of the US military were in Arlington, Virginia seeking answers about what happened to their loved ones. According to the US government, the whereabouts of more than 7,800 Americans who participated in the Korean War are unknown. Of these, about 5,300 died in North Korea. For Sergeant McDaniel’s family, the plaque gave them a concrete item on the military’s legacy. “We are grateful for that,” said Charles.